The Allatians believe that they have a writing system superior to all others. Unlike books written in alphabets, syllabaries, or logograms, an Allatian book captures not only words, but also the writer’s tone, voice, inflection, emphasis, intonation, rhythm. It is simultaneously a score and recording. A speech sounds like a speech, a lament a lament, and a story re-creates perfectly the teller’s breathless excitement. For the Allatians, reading is literally hearing the voice of the past. But there is a cost to the beauty of the Allatian book. Because the act of reading requires physical contact with the soft, malleable surface, each time a text is read, it is also damaged and some aspects of the original irretrievably lost. Copies made of more durable materials inevitably fail to capture all the subtleties of the writer’s voice, and are thus shunned. For the most influential works, hundreds, thousands of interpretations exist in circulation, and they, in turn, are interpreted and proliferate through new copies. The Allatian scholars spend much of their time debating the relative authority of competing versions and inferring, based on the multiplicity of imperfect copies, the imagined voice of their antecedent, an ideal book uncorrupted by readers. A Quatzoli’s body is made out of copper and shaped like an hourglass. Their planet, tracing out a complicated orbit between three stars, is subjected to immense tidal forces that churn and melt its metal core, radiating heat to the surface in the form of steamy geysers and lakes of lava. A Quatzoli ingests water into its bottom chamber a few times a day, where it slowly boils and turns into steam as the Quatzoli periodically dips itself into the bubbling lava lakes. The steam passes through a regulating valve—the narrow part of the hourglass—into the upper chamber, where it powers the various gears and levers that animate the mechanical creature. Some of the more violent races of the universe, such as the Hesperoe, once delighted in extracting and collecting the stone brains of the Quatzoli. Still displayed in their museums and libraries, the stones—often labeled simply “ancient books”—no longer mean much to most visitors. At this point, the process of mapping begins. Carefully, meticulously, a team of master cartographers—assisted by numerous apprentices—trace out each of the countless minuscule tributaries, impressions, and hunches that commingle into the flow and ebb of thought, until they gather into the tidal forces, the ideas that made their originators so great. Once the mapping is done, they begin the calculations to project the continuing trajectories of the traced-out paths so as to simulate the next thought. The charting of the courses taken by the great, frozen minds into the vast, dark terra incognita of the future consumes the efforts of the most brilliant scholars of the Hesperoe. They devote the best years of their lives to it, and when they die, their minds, in turn, are charted indefinitely into the future as well. In this way, the great minds of the Hesperoe do not die. To converse with them, the Hesperoe only have to find the answers on the mind maps. Thus, they no longer have a need for books as they used to make them—which were merely dead symbols—for the wisdom of the past is always with them, still thinking, still guiding, still exploring. But it is the event horizon around a black hole where the Tull-Toks claim the greatest books are to be found. When a Tull-Tok is tired of browsing through the endless universal library, she drifts toward a black hole. As she accelerates toward the point of no return, the streaming gamma rays and X-rays unveil more and more of the ultimate mystery for which all the other books are but glosses. The book reveals itself to be ever more complex, more nuanced, and just as she is about to be overwhelmed by the immensity of the book she is reading, her companions, observing from a distance, realize with a start that time seems to have slowed down to a standstill for her, and she will have eternity to read it as she falls forever toward a center that she will never reach. Still, some continue to seek out the Tull-Toks as interpreters of the books of nature they claim to see all around us. The interpretations thus produced are numerous and conflicting, and lead to endless debates over the books’ content and—especially—authorship. In contrast to the Tull-Toks, who read books at the grandest scale, the Caru’ee are readers and writers of the minuscule. Small in stature, the Caru’ee each measure no larger than the period at the end of this sentence. In their travels, they seek from others only to acquire books that have lost all meaning and could no longer be read by the descendants of the authors. Due to their unimpressive size, few races perceive the Caru’ee as threats, and they are able to obtain what they want with little trouble. For instance, at the Caru’ee’s request, the people of Earth gave them tablets and vases incised with Linear A, bundles of knotted strings called quipus, as well as an assortment of ancient magnetic disks and cubes that they no longer knew how to decipher. The Hesperoe, after they had ceased their wars of conquest, gave the Caru’ee some ancient stones that they believed to be books looted from the Quatzoli. And even the reclusive Untou, who write with fragrances and flavors, allowed them to have some old bland books whose scents were too faint to be read. The Caru’ee make no effort at deciphering their acquisitions. They seek only to use the old books, now devoid of meaning, as a blank space upon which to construct their sophisticated, baroque cities. The incised lines on the vases and tablets were turned into thoroughfares whose walls were packed with honeycombed rooms that elaborate on the pre-existing outlines with fractal beauty. The fibers in the knotted ropes were teased apart, re-woven, and re-tied at the microscopic level, until each original knot had been turned into a Byzantine complex of thousands of smaller knots, each a kiosk suitable for a Caru’ee merchant just starting out or a warren of rooms for a young Caru’ee family. The magnetic disks, on the other hand, were used as arenas of entertainment, where the young and adventurous careened across their surface during the day, delighting in the shifting push and pull of local magnetic potential. At night, the place was lit up by tiny lights that followed the flow of magnetic forces, and long-dead data illuminated the dance of thousands of young people searching for love, seeking to connect. Yet it is not accurate to say that the Caru’ee do no interpretation at all. When members of the species that had given these artifacts to the Caru’ee come to visit, inevitably they feel a sense of familiarity with the Caru’ee’s new construction. For example, when representatives from Earth were given a tour of the Great Market built in a quipu, they observed—via the use of a microscope—bustling activity, thriving trade, and an incessant murmur of numbers, accounts, values, currency. One of Earth’s representatives, a descendant of the people who had once knotted the string books, was astounded. Though he could not read them, he knew that the quipus had been made to keep track of accounts and numbers, to tally up taxes and ledgers. Or take the example of the Quatzoli, who found the Caru’ee repurposing one of the lost Quatzoli stone brains as a research complex. The tiny chambers and channels, where ancient, watery thoughts once flowed, were now laboratories, libraries, teaching rooms, and lecture halls echoing with new ideas. The Quatzoli delegation had come to recover the mind of their ancestor, but left convinced that all was as it should be. It is as if the Caru’ee were able to perceive an echo of the past, and unconsciously, as they built upon a palimpsest of books written long ago and long forgotten, chanced to stumble upon an essence of meaning that could not be lost, no matter how much time had passed. Pockets of sentience glow in the cold, deep void of the universe like bubbles in a vast, dark sea. Tumbling, shifting, joining and breaking, they leave behind spiraling phosphorescent trails, each as unique as a signature, as they push and rise toward an unseen surface. 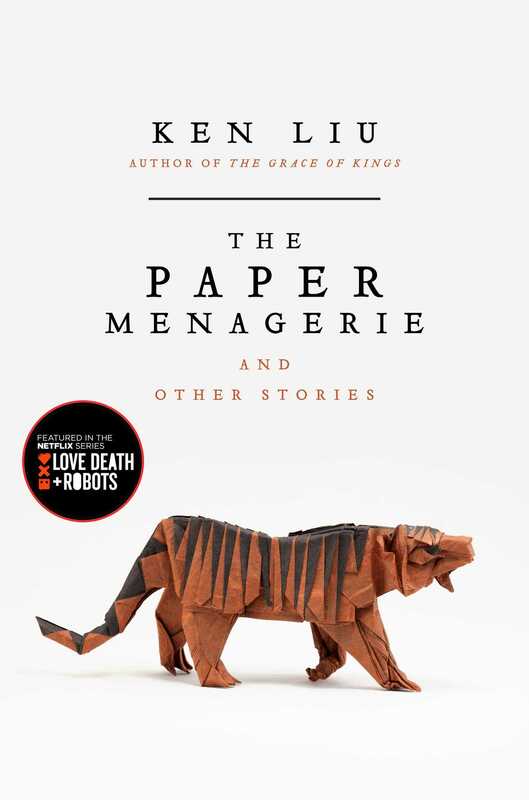 "I know this is going to sound hyperbolic, but when I’m reading Ken Liu’s stories, I feel like I’m reading a once-in-a-generation talent. I’m in awe." These remarkable stories highlight Liu’s themes of family, love, and politics and gathered in one collection pack an even bigger punch. Those who revere shorter speculative works will definitely want this book. Emotionally unpredictable, Liu's stories take off in unexpected directions and arrive at destinations both startling and satisfying. Liu’s wondrous tales eloquently explore the place where ordinary and the extraordinary meet. There is a dark and sometimes shocking edge to some of these stories, but nearly all are provocative, and several are brilliant. Liu's book compiles brilliant stories written in several different, overlapping modes, a technically dazzling collection of compulsively readable narratives, presenting characters with agonizing moral dilemmas and never forgetting the heart. Liu’s talent in evoking atmosphere and culture make these tales more than stories – they’re journeys. If you’re looking to dream of another world, or reflect on our own, do yourself a favor and pick up a copy of The Paper Menagerie.